The drug will be available to patients with 'exceptional clinical needs'. 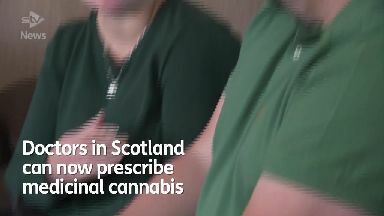 Doctors in Scotland will be able to prescribe medicinal cannabis from today. The drug will be available to patients with "exceptional clinical needs" who have been referred to a specialist for their condition. Patients who suffer from chronic pain, epilepsy and chemotherapy-induced nausea will be among those to benefit from the treatment. Medicinal cannabis has a far lower THC content that regular cannabis, allowing users to benefit from its therapeutic qualities without experiencing a high. It was outlawed in 1971 but is now being made available across the UK after home secretary Sajid David was advised by the Advisory Council on the Misuse of Drugs that it has therapeutic benefits. In a landmark case earlier this year, the mother of Billy Caldwell, a 12-year-old boy with epilepsy, won the right to have medicinal cannabis prescribed for her son, a move which opened the doors for legal reforms to make the drug freely available. In legalising medicinal cannabis, the UK joins many other countries around the world where the drug is available. Countries including Canada, Portugal, Spain and much of the US now allow cannabis to be used as medication and, in many instances, for recreation. In virtually all cases, these countries have reported a corresponding drop in drug-related crime as well as a significant economic boost - Canada's medicinal marijuana industry is estimated to be worth more than £500m.